"It was absolutely devastating when I got the news," Jasen Kasten says about the day he was told his friend Dave had died. They'd become friends over three years of playing World of Warcraft together. Jasen says the grieving process was just as difficult as it would have been for a friend in real life. Dave died from complications due to back surgery earlier this year. "A lot of my friends have been cultivated over the internet, so for me it had absolutely no difference whatsoever," Jasen says. "It could have been someone I had known from high school or had been in my weekly sports league or anything else. "I'm still feeling quite devastated." 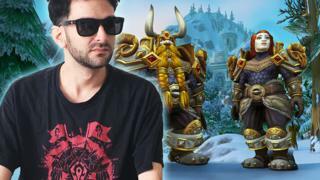 Jasen and his Warcraft 'guild' (the group he plays with online) met on the internet - but he says they live by a motto that what's happening offline is more important than on. "A couple of times Dave said: 'Listen guys, I'm really not feeling well, I'm going to have to bow out,'" Jasen tells Radio 1 Newsbeat. "We always say: 'Real life first'. You take care of your family and your health first." Dave lived in Florida, the same US state as Jasen - but despite various attempts, they'd never said hello face to face. After Dave's death, Jasen turned to his World of Warcraft friends. "We were also able to bounce ideas and feelings off each other and also share our grief and moments we had with him," he says. But as well as sharing stories, their group held an online event to commemorate Dave's death. "We did some of the content that we had enjoyed and had our best memories with our friend," remembers Jasen. "As we went through different parts of the content we all had different anecdotal memories of him and jokes we used to make. "He was really a fixture of our family and of our weekly gathering." And while Jasen was taking part in Dave's online memorial, his wife Marti overheard and shared the story on Twitter. "I'm sitting here listening to them having a conversation about their friend and it's moving. It was heart-warming and I just threw it out into that space," she tells Newsbeat. Describing herself as a casual gamer and a "gamer wife", Marti's tweet reached thousands of people - and others soon shared their own experiences of mourning their online friends. Rob Farmer replied saying he still sends messages to his gamer friend Marty who died in 2017. "When you lose a person you speak to every single day, it hits you differently," Rob says. "I can say without a doubt that the distance between us did not make losing him any less awful." Marty was a dad and Rob now messages him about his own experiences as a father. "I like to message Marty and tell him about my son," he says. "I tell him how much I miss him. I still talk to him about the hard things in life that he would usually help me with. "I tell him I love him and I wish he was still here." When Connor Strange from Ammanford in South Wales lost his friend he'd met playing Star Trek Online, he turned to a virtual community to cope with his loss. "I don't really have that many friends in real life, so it was difficult to try and find a platform where I could engage with people and grieve the way I wanted to," he says. He used Microsoft's online network, Xbox Ambassadors, to find support after his friend James died earlier this year. Users of Xbox Ambassadors are rewarded for making a positive impact on the Xbox community by making the system a "safe and welcoming place to play" with interactions and support for each other. "There are loads of people I get to talk to through that and they're all going through similar things," he says. "They understand what I'm going through, even though I don't know what they look like or I've never seen them." Marti says the feedback she got from her tweet was "amazing", and that she was inspired by the stories gamers shared of their own experiences of grief. Now, Marti and Jasen are hoping to encourage more gamers to take the time to meet their online friends in real life through a project called Gamers IRL. "It's sad enough that we didn't have the opportunity to meet someone who was so close to us but these things are happening on a global scale," says Marti. "This is unacceptable to me." "If there's anything we can do in the honour and memory of our friend, it's bridging the gap for other friendships and bringing other friendships together." There's more information on dealing with grief at the BBC Advice pages.